It is almost the end of the week and I still have some great finds from my trip to last Saturday’s farmers market. It was good fortune or should I say “Fortune Plums” that I saw overflowing in a wicker basket. Picking up a half dozen of these plump plums I decided they would make a great addition to a fresh green salad. 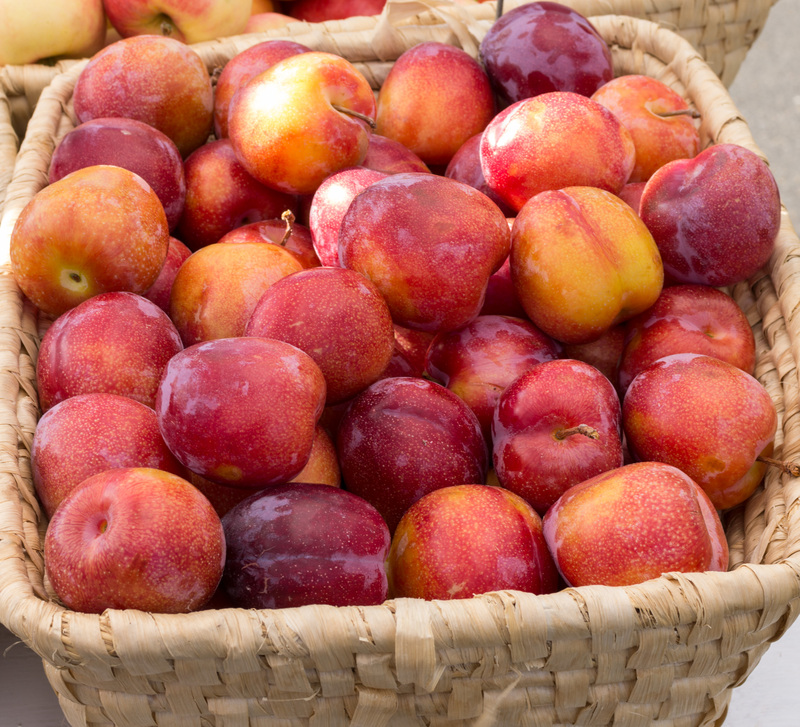 If you are not familiar with these plums they were developed by the United States Department of Agriculture and released in New Zealand in the mid-1980’s. The plum is large, juicy with a bright red and yellow skin. You can use them in salads, desserts like cobblers and tarts or just to eat fresh. In medium bowl combine the plums, lime juice, lime zest and honey, set aside. Prepare the balsamic dressing by placing all the ingredients in a pint size mason jar and shake for about 15 seconds, set aside and make the salad. Place 2 cups of the mixed greens on a plate, (I use a mixture of leaf, romaine and iceberg lettuce). Slice the chicken and place 1/3 over the greens. Sprinkle 1/3 each of the feta cheese and red raspberries plus 1 tablespoon of the hazelnuts over the salad greens. 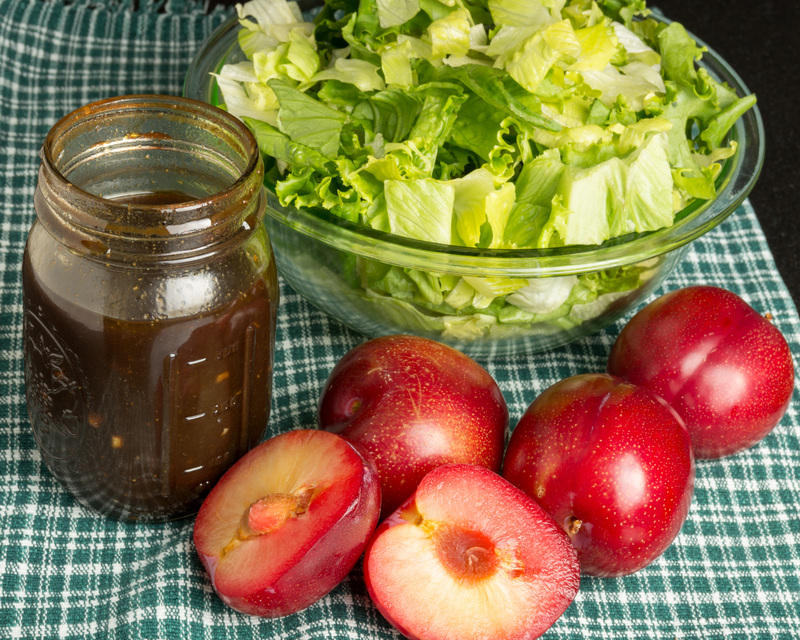 Place plums around the salad and make sure you get some of the delicious lime juice. Shake the dressing again for a few seconds and spoon the desired amount over the salad. You will have some of the balsamic dressing left over for other delicious salads. 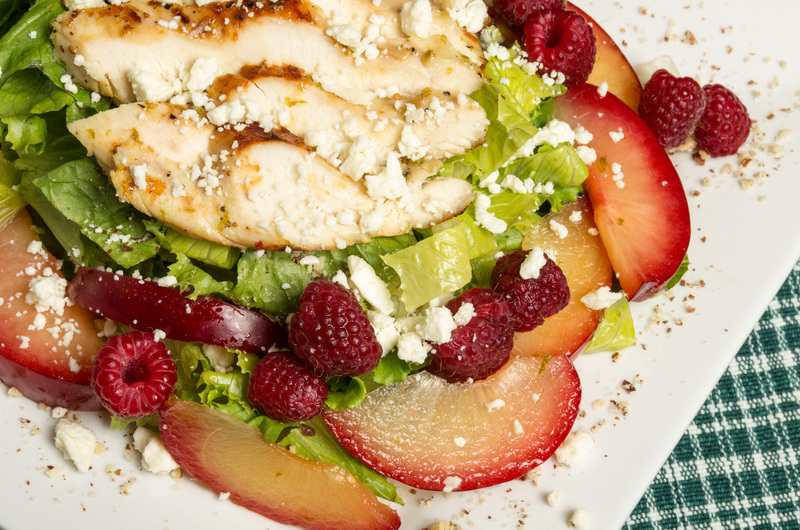 You can also make this salad with other fruits like peaches, apples and pears.